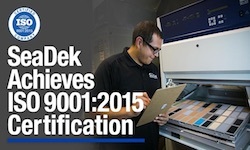 SeaDek Earns ISO 9001:2015 Cert. Rockledge, FL (March 28, 2017) -In keeping with their dedication to constant improvement and customer satisfaction, SeaDek Marine Products, the leading manufacturer of EVA non-skid products for the marine industry, is pleased to announce their upgraded re-certification to ISO 9001:2015 standards. SeaDek is one of the first businesses in the country to achieve certification to the new standard. After their initial ISO 9001:2008 certification in 2013, SeaDek has used the ISO processes to streamline manufacturing, minimize waste and errors, increase productivity and efficiency, and make evidence based decisions to better grow the company and provide exceptional customer service. With the new standards comes the consideration of risk management, both equipment-specific and company-wide, which will aid in effectively developing contingency plans and solutions, securing the supply chain to ensure consistent delivery of products and services to an international customer base. "The ISO standards have provided a great foundation upon which to document all processes within the company; all aspects of our business were analyzed in seeking certification," said Dustin Emanis, VP of Quality at SeaDek. "The formation of this baseline allows us to seek continuous improvement to every process independently and collectively." With their new ISO 9001:2015 certification, SeaDek is well equipped to continue their expansion into new international markets, bringing their innovative non-skid products to boat builders and end-users across the globe. Learn more at http://www.seadek.com.